If you ask me, globsters have the makings of a terrible (but great) horror movie. What is a globster? So glad you asked. A globster is"¦ well"¦ it's kind of hard to define. Basically, it's a blobby-looking, unidentifiable carcass that has washed up on a shore somewhere. Some globsters have bones, some don't. Sometime they have tentacles, flippers and eyes, sometimes they don't. One of the most famous globsters is the St. Augustine Monster. It was first spotted by a couple of kids riding bikes on the beach on November 30, 1896. It had sunk into the sand under its own weight "“ only about half of it was visible to the boys. They thought it might be the leftovers of a beached whale, because something similar had happened in the same area a couple of years before. They reported the blob to a local physician, who went to the beach to inspect it the next day. He estimated that the carcass weighed five tons and that it might be a giant octopus because he could make out what he thought was four arm stumps, with another stump buried in the sand nearby. "The head is as large as an ordinary flour barrel, and has the shape of a sea lion head. The neck, if the creature may be said to have a neck, is of the same diameter as the body. The mouth is on the under side of the head and is protected by two tentacle tubes about eight inches in diameter and about 30 feet long. These tubes resemble an elephant's trunk and obviously were used to clutch in a sucker like fashion any object within their reach. "Another tube or tentacle of the same dimensions stands out on the top of the head. Two others, one on each side, protrude from beyond the monster's neck, and extend fully 15 feet along the body and beyond the tail. The tail, which is separated and jagged with cutting points for several feet, is flanked with two more tentacles of the same dimensions as the others and 30 feet long. The eyes are under the back of the mouth instead of over it." Yikes. Over the years, it has been speculated that, among other things, the carcass was that of a sea monster, a giant octopus, a sperm whale and a giant squid. A chunk of the blob was preserved at the Smithsonian, and over the years it has been tested by various scientists. The most recent, conducted in 2004, concluded that it the globster had once been a whale. In fact, research is now showing that most of the globsters are probably just big chunks of blubber that have fallen off decomposing whales. Delightful. Or maybe that's just a conspiracy to make us think that's what globsters are (I saw Cloverfield last weekend, people). 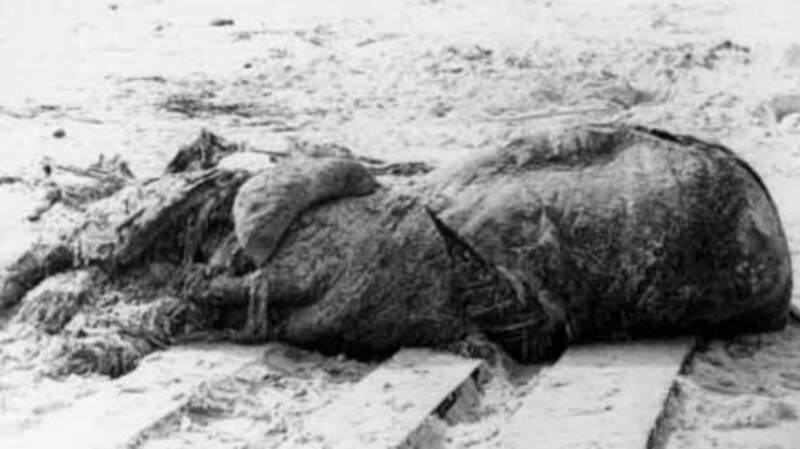 "¢ The Tasmanian Globster washed up on the shores of western Tasmania in 1960, measured about 20 by 18 feet and weighed somewhere between five and ten tons. It didn't have any eyes, and instead of a mouth it had "soft, tusk-like protuberances". It did have a spine, in addition to six fleshy arms and stiff white bristles all over its body. "¢ The Bermuda Blob was found by fisherman Teddy Tucker in Mangrove Bay, Bermuda, in May 1988. Compared to the others, this guy was relatively small: only about three feet thick. He described it as being white and fibrous and having five arms kind of like a starfish. Turns out it was just the remains of a big shark. "¢ In 1990, a globster was found across the pond in Hebrides, Scotland. It was found by Louise Whitts, who said it looked like it has a head at one end, furry skin and lots of fin shapes along its back. No samples were taken of the Hebrides Blob, so it's unknown what it was exactly. "¢ Tasmania is a popular gathering ground for these things, I guess, because the Four Mile Globster was found on Four Mile Beach in Tasmania in 1997. It was 15 feet long and weighed about four tons. It was described a lot like the first Tasmanian Globster: strands of white hair, fleshy lobes and some flipper/arm like things. This one was also never tested. Suspicious! The Chilean Blob really takes the cake"¦ or the beach, as it were. The 13-ton (!) globster (below) was found in the sand in Los Muermos, Chile, in July 2003. At the time, biologists couldn't figure out what it could possibly be and thought that it might be some sort of giant octopus previously unknown to man. About a year later, after DNA testing, they discovered that some of the DNA matched that of a sperm whale and the blob was just part of a whale's remains. Really, all I have to say about any of that is "ew". Can you imagine swimming in the ocean and accidentally brushing your leg up against any of that? I'm so grossed out right now. What do you guys think? Whales? Unidentified sea creatures? Government cover up?? Despite my joking, I think whale blubber seems pretty plausible.